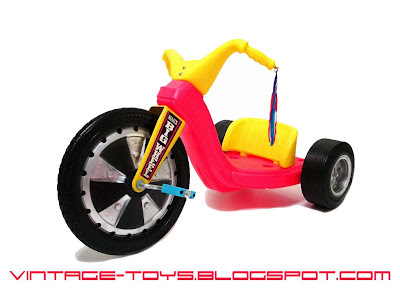 Anyone who grew-up in the 1970's has to remember this classic toy, It's the BIG WHEEL by Marx! I remember that, as kids, we all learned that if you got a lot of speed, sort of went into a slight turn & hit the hand brake then WHOOOSSSHH! You would spin-out like crazy, ha ha! Ahhhh, good times. This was a really great ride-on toy. 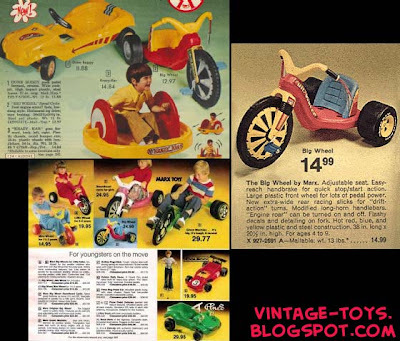 The Big Wheel was created by Louis Marx Toys and unveiled to the public at the 1969 New York City Toy Fair. The Big Wheel immediately became a national success! 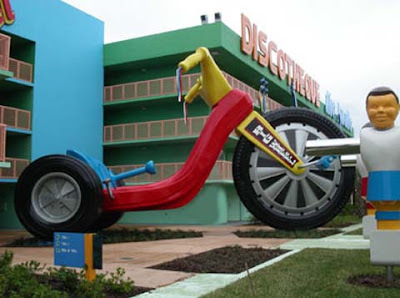 One of their early sales brochures reads as follows, "The Big Wheel by Marx. Adjustable seat. Easy-reach handbrake for quick stop/start action. Large plastic front wheel for lots of pedal power. New extra-wide rear racing slicks for "drift-action" turns. Modified long-horn handlebars. "Engine roar" can be turned on and off. Flashy decals and detailing on fork. Hot red, blue, and yellow plastic and steel construction. 38 in. long x 201/2 in. high. For ages 4 to 9." 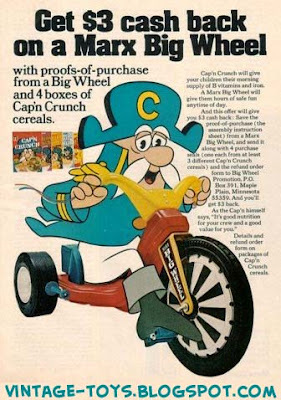 Here's some photos to enjoy ( I love the classic Vintage Ads, especially the one with Cap'n Crunch ) & remember to watch the YouTube Vintage Toy Commercial at the end. Also, the large picture of the BIG WHEEL, with the bright-white background, is actually a HUGE Desktop Wallpaper. 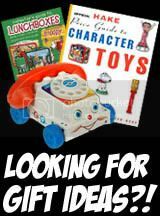 Click on it, then add this Classic Vintage Toy to your PC Desktop or put it in a MySpace layout!